The Shelburne subdivision is a new home community located in Southeast Meridian, ID, just south of Victory and Eagle Rds. The majority of homes for sale in Shelburne consist of single-level floor plans on larger building lots. The community continues the Meridian tradition of large elaborate entrances, well-designed landscaping and includes a large community common area with a pond and walking bridge. Learn more about Shelburne real estate below. 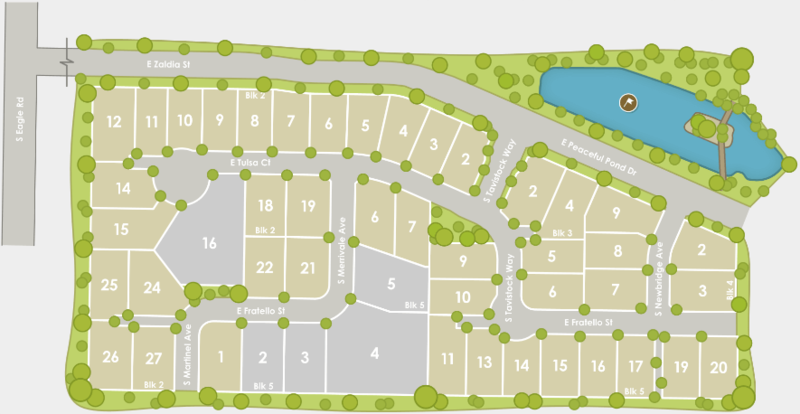 Explore our new Meridian subdivisions guide or search all new homes in Meridian Idaho by neighborhood, price, builder and more. From S Eagle Rd and W Victory Rd head South on Eagle. Turn left (east) on E Zaldia Ln, then right (south) on S Tavistock Way, Meridian, ID 83642. Questions about Shelburne real estate? Please don't hesitate to Contact Us Online or call (208) 391-4466. Our qualified Meridian agents are here to help 7 days a week.